The 4 directions figure so prominently at Latin spiritual ceremonies we organized the Bay Area into 4 directions with the inner mission as the center. San Francisco after all is at the edge of the earth while its inner mission district as the birthplace of the Bay Area and metro center for its creative and immigrant communities is often considered the heart. "In the United States, the communal celebration of Day of the Dead emerged in the early 1970s, following political movements that spurred Mexican Americans to reclaim their ancestral heritage. In the decades since, the practice has attracted people of many faiths and backgrounds. " The very popular Oakland Museum has featured a Day of the Dead exhibit since 1994, and features a community celebration as well. The largest festival in Oakland, Alcohol free daytime till 6pm. The Annual Dia de Los Muertos Fruitvale Festival takes place on International Boulevard between Fruitvale Avenue and 40th Avenue and in the Fruitvale Village Plaza in the Fruitvale district of Oakland, CA. The Latin Zone in Oakland is centered around Fruitvale, a BART stop featuring BART's newest model transit village. Since 1995, on the Sunday closest to Nov 2nd, a large street festival is held featuring Aztec dancers and day of the dead craftwork. has provided quality, low cost arts training to youth since 1994.
which opened in 2000 to widespread acclaim. The best know Latin street in America is Olvera Street in Los Angeles - dia_de_los_muertos at olvera-street.com - and a sometime model for the Mission's 24th Street. However the highest concentration of Latin restaurants is now South of Chavez on Mission, in nearby lower Bernal Heights. The Mexican Museum is poised to fulfill its long-held dream of building a new permanent facility in the heart of San Francisco's Yerba Buena arts district at Mission and 3rd Streets. The new building will increase the Museum's square footage six-fold, with vastly expanded gallery space, education facilities, a community multi-purpose room, enlarged collection holding areas and increased technological capabilities. This new facility will house and present the Museum's collection of over 12,000 culturally and artistically significant objects, providing a magnificent home in which the cultural life of Latino communities can be voiced and shared for generations to come. The Mexican Museum is currently located at Fort Mason Center, Building D, Marina Boulevard and Buchanan Street, San Francisco. The Cultural Arts Council of Sonoma County has presented installations by local high schools and community groups, with public participation in creating a community altar in past years. At the Cultural Arts Council Gallery, 529 Fifth St. in Santa Rosa. 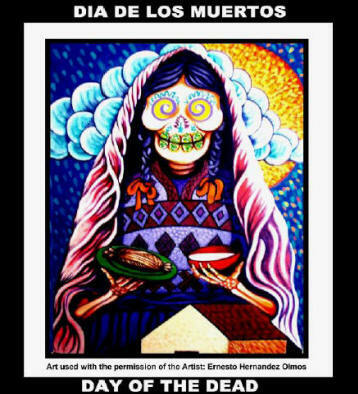 Petaluma Arts Council has organized the Petaluma Day of the Dead celebration since 2000. During the mid-fall season the city is alive with an entire range of events, including the traditional ofrendas (altars) in many locations, bilingual story telling, instruction in traditional sugar skull-making, fine arts exhibits, film, poetry and music celebrations and much, much more. Search for Dia de Los Muertos in San Rafael or visit the City of San Rafael site. "Day of the Dead has nothing to do with Halloween, which is European," said Patricia Rodriguez, gallery director at the Mission Cultural Center. "This is a Mexican tradition that has been celebrated since the Aztecs." The North America's oldest and most spectacular Day of Dead Procession begins at 6pm every November 2, between the MCC and the Galeria along 24th Street. HOW: Take BART to the 24th Street Station. 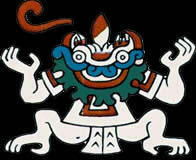 Go to the Mission Cultural Center for pre procession events and orientation. The San Francisco Day of The Dead Ritual Procession is a project of El Colectivo Del Rescate Cultural. For information: Contact Juan Pablo Gutierrrez, the Procession Director, 415-405-2020 or juanpablodod at aol.com. Balmy Alley is not only everyone's favorite place to view murals, but the highlight of the annual Day of the Dead procession. The magic of more than 30 murals, spiced with overflowing gardens, creates a feeling of sacred space. During the day visit PrecitaEyes.org. Like many commercial districts in the San Francisco Bay Area, the Mission corridor entertains thousands of children in costume trick or treating along Mission, 16th and 24th Streets. If you prefer your festivals to be mythically correct like the ancients ,then you should integrate these ancestor rituals into Halloween. Day The Bay Area has one of the world's most famous Halloween celebrations on October 31st - SF Bay Area Halloween Events Directory by google. Despite rumors to the contrary, the Christian religion is still the most dominant and ubiquitous in the Bay Area and for practicing Catholics. All Saints Day on November 1st is a holy day of obligation as well as Night of the Angels. For Christians, All Saints Day is like a solemn Memorial Day to remember the heroes and martyrs. The Mission has more churches (as well as bars) per capita than any neighborhood in California. 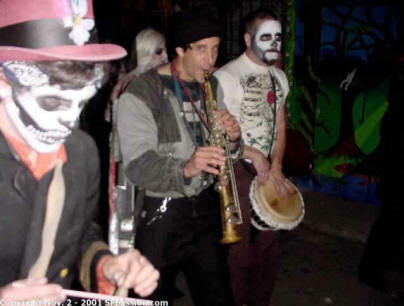 However, in the SF Mission, Night of the Angels is October 31st as merchants along 24th St. Mission St and 16th St pass out candy to thousands of darling young Latin costumed trick or treaters. Three most venerable gallery spaces will generally put together annual shows lasting as long as a month. Billboard and window displays combine with gift store to offer you a worthwhile bet. Shop for produce and panderias while your in the neighborhood Good to confirm hours of operation in advance. Since 1998 Soma has hosted a major "rooms for the dead" exhibition which often includes a party or 3 set amidst the macabre scenery. Growing participation from the many Burning Man performance artists who make up the inimitable art event which begins the fall season on Labor Day weekend. "the music is the real story teller here and it tells a story of its own, of a life mourned and yet celebrated. I think it is perhaps one of the best ways to experiance another culture; through its music. In short this book CD set is wonderful. The dance of life goes on! "